For those of us with a skin sensitivity palladium white gold is a great alloy. Palladium is from the Platinum group of metals, all of which are hypoallergenic. For the most part all precious jewellery is made with materials that will not cause a skin sensitivity, however, about 5% of the population will have a reaction to certain metals that are used in common jewellery alloys. Alloys are created to make metals harder so that they will stand up to normal wear and tear. Pure gold and silver are very soft so in order to toughen them up other metals such as silver, copper and nickel are added. It’s very uncommon for pure gold, silver, palladium or platinum to cause a skin sensitivity. The usual cause is the copper or nickel that is added to the alloy. Copper is added to create sterling silver and all karats of yellow gold and rose gold below 24k. Nickel is added to all karats of nickel white gold to bleach out the yellow of pure gold. It’s the most common alloy of white gold sold commercially. Palladium white gold uses palladium to bleach out the yellow instead of the nickel. By removing the nickel, you remove the skin sensitivity. Although palladium white gold is the most common alloy of white gold in Europe it is also readily available here locally in Toronto. Any ring, necklace, pendant, bracelet or set of earrings of your choice can be made using palladium white gold instead of nickel white gold. Because palladium is from the platinum group of metals it is more expensive than nickel. This means that palladium white gold is roughly 30% more expensive than nickel white gold. Probably the most obvious difference between nickel white gold and palladium white gold is the colour. Palladium has a deeper, grey-ish undertone and nickel white gold is a brighter white. It can be hard to capture the colour difference with a camera but I’ve tried my best with the image to the right. In fact, if you were to compare two highly polished rings your eye may have a hard time telling the difference between the two. It’s only a subtle difference but there definitely is a difference. So how do you know that palladium white gold is right for you? Definitely if you have a skin sensitivity and don’t fancy paying the price of platinum. 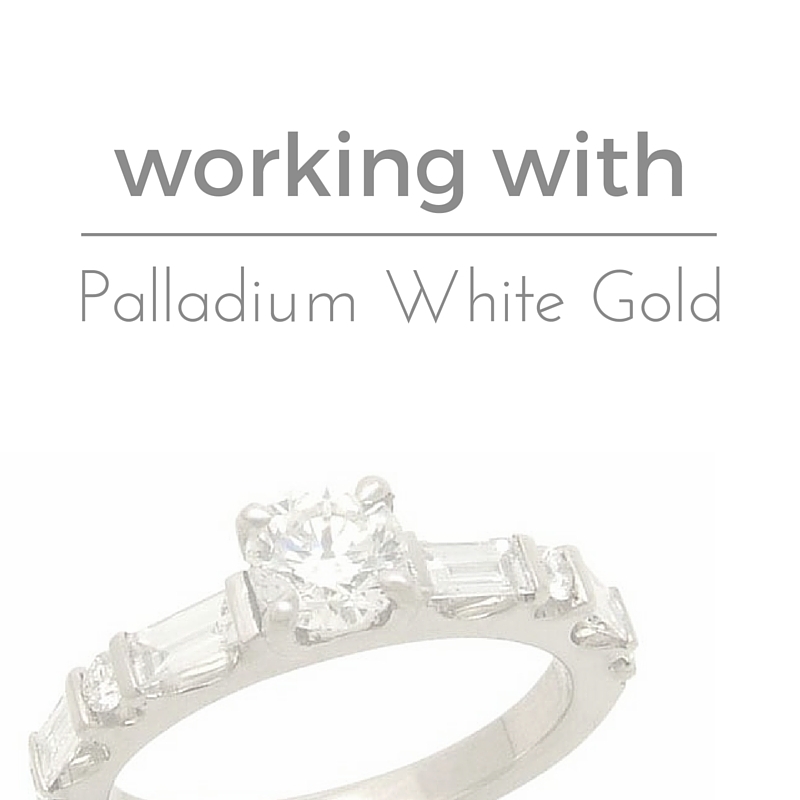 Also if you like more of an ‘antique’ look then you may want to consider palladium white gold. If you are curious about this beautiful alloy or would like to see the colour difference between nickel white gold and palladium white gold in person I’d be happy to help with any questions that need answering. What’s the deal with rhodium plating?